Peppers are an essential Spanish ingredient, whether they are fresh, roasted or fried; served as a side dish or a tapa. Peppers are an important ingredient in many Spanish dishes, such as gazpacho (cold tomato soup), romesco sauce or sofrito. They add color and flavor to many dishes and are nutritious, too. Fried or roasted peppers make an appearance at dinner tables across Spain several times per week in the summer. They go well with roast meats, grilled steak, pork chops, or fried or scrambled eggs. Serve these fried peppers on a platter with slices of rustic bread as a tapa, or as a side dish. Thinly cut beef fillets are shown in the photo, accompanied by fried red peppers and onions. 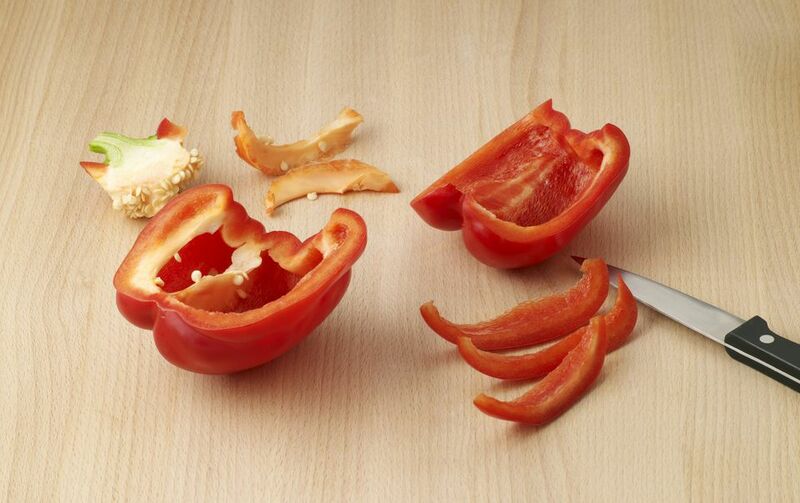 Rinse peppers, then remove stems, seeds, and membranes. Cut in julienne slices (lengthwise, about 1/4-inch wide). Peel and cut the onion into julienne slices. Pour 4 to 5 Tbsp olive oil into a heavy bottom frying pan and heat on medium. When oil is hot, fry pepper strips, stirring often. When peppers begin to soften, add onion slices and continue to fry. Salt to taste. Remove from pan when onions soften and become translucent. Serve on a platter with rustic bread as a tapa, or to accompany roast meats, fried pork chops or eggs.